Grupo SANED is committed to powering corporate responsibility policies with a strong ethical component that foster actions to improve society. In this way we improve the social, economic, environmental in a voluntary way. Heroes’s Potion was one of the actions carried out by the company. This groundbreaking project was the outcome of conversations held with the paediatric oncohaematology team at Hospital La Paz, where a multidisciplinary group of oncologists, psychologists and nurses develop the project and make it a reality. Heroes’ Potion began after months of hard work. Following its successful launch at La Paz, other hospitals and patients’ associations expressed their interested in the project, which has also put in place a detailed expansion and development plan for the coming years. The vast majority of children with cancer can be cured. The early days of treatment are the most stressful for children. The paediatric oncologist is responsible for treating the disease, but he or she needs other tools to combat the children’s fear, frustration and anxiety… the first step in fighting a disease is to believe in the cure. Children with cancer undergo very tough treatments and are considered true heroes. So we want to give them superpowers to take on this fearsome adventure. Heroes’ Potion has turned the image of cancer treatment on its head, empowering children and their families in the fight against the disease and changing the children’s perceptions and fear of treatment. 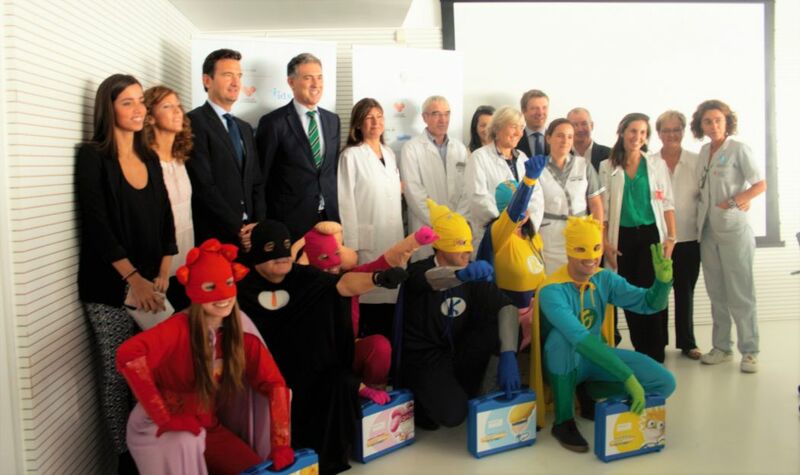 When a child starts treatment, the hospital teams give him or her the Heroes Catalogue from which they choose their favourite character from among three boys and three girls. The character they choose will help them fight Villanus, the cancer cell, lending them their superpowers and accompanying them over the course of their treatment. From then on, chemotherapy is seen as a Super Hero Potion. Once they’ve chosen their favourite character, the child receives a bag of powers from their hero. Each item in the powers bag is designed to help the child have a heroic adventure during treatment. Letters signed by their hero. One informs the child of their mission and how to use the items in the bag. The other, addressed to the parents, has keys to joining in with the game. A comic book in which each character will have an adventure fighting Villanus. Stickers with their hero’s insignia to attach to the chemotherapy bag. Hey presto! Chemo becomes a true potion with superpowers! Insignia: An XL sized badge with the hero’s insignia that the child can pin on their pyjamas or t-shirt. A passport to stamp each treatment session, accrediting a new battle they have won against Villanus. A poster to decorate their room. A bag of delicious sweets to give our heroes energy.